There is now an opportunity to visit the Maralinga Atomic Testing grounds, a site hitherto out of bounds since the British nuclear program finished in 1963. 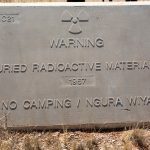 Located in the remote area to the north west of Ceduna, in South Australia, Maralinga has had extensive and expensive cleaning up and rehabilitation, supervised by the Australian Radiation Protection and Nuclear Safety Agency (ARPANSA). The third and final clean-up was completed in 2000 and visitors can now safely join a conducted tour of the remediated grounds that hosted seven nuclear weapons tests in the 1950s. Learn about a very, very dark chapter in Australia’s history. One Tree, Marco, Kite, Breakaway, Tadje, Biak and Taranaki: innocuous sounding names that at the time provided headlines in the British and Australian press that heralded a growing capacity for Britain to offer a nuclear deterrent to the perceived threat of the Cold War. More historical background. The tour bus can accommodate a maximum of 24 Passengers. Arrive at the locked gates at Maralinga on the evening before your tour begins. Your tour host will rendezvous on a pre-arranged, permitted entry schedule. It is just a few minutes’ drive from the gates up to the Maralinga Village campground. There are hot showers, time to use the laundry facilities, to check emails, to recharge phones and laptops and to settle in for the evening. There is a collection of videos from the National Archives available to play in the Village, providing a fascinating introduction to tomorrow’s full day tour. Your mini bus will collect you from the campground at 9.30am. Visit the enormous airstrip built to enable the British, away from prying eyes, to securely and privately fly their equipment into the Maralinga site. The fully serviced, 3,000 metre bitumen strip continues as an emergency strip for aircraft flying across Australia and was chosen as the backup landing site, if needed, for the US space shuttle! On the way to the Forward Area, the tour stops beside a fenced-off, hand dug well – a sign explains it was dug by William Tietkins, (Ernest Giles’ fellow traveller), in 1879 in an attempt to secure a pastoral block. Visit the burial pits - huge, deep pits that now contain 500,000 cubic metres of contaminated topsoil, graders, bulldozers, four-wheel drive vehicles and other equipment used in the final clean up. Each burial pit has been capped with 5 metres of clean soil. As the tour continues through the Forward Area, stories about the program unfold.